During a party Naughty John’s spirit is awoken. The known serial killer is following a ritual of a religious cult that wants the world to end. Meanwhile Evie who can see memories by reading objects gets send to New York to her uncle Will who has a museum on the occult. Will starts helping the police in the investigations of John’s murders and unwillingly involves Evie. During their investigation they find out about the ritual and how to banish John. When Will gets framed by John, he is arrested for the murder and Jericho and Evie are on their own. Evie manages to banish him and the police covers that it was a ghost who murdered the people. 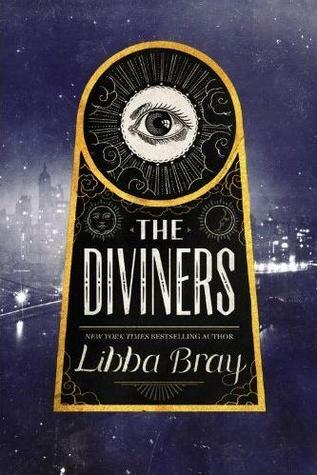 Meanwhile the Diviners gain powers and different secrets about them are revealed. At a party teens get bored and start playing with an Ouija board. Naughty John answers but they dismiss it as a trick. They don’t banish his spirit afterwards so that he can walk freely. Meanwhile Evie uses her gift (seeing memories by reading objects) at a party while drunk and humiliates a guy, telling everyone that he knocked up a girl who is not his fiancé. She is then sent to NY to her uncle Will as punishment. In NY at the train station she runs into Sam Loyd who promptly steals her money while flirting with her. He is a pretty good thief because his ability is to redirect peoples’ thoughts. Jericho is a “human-automaton-hybrid”. Due to infantile paralysis he was unable to move his body. Marlow (from Marlow Industries) healed him with his new invention and Will became his guardian. He has to take a serum regularly. No one but the three know about Jericho’s condition. Mabel, just like Will and Jericho, lives at the Bennington where Evie befriends Theta Knight, a Ziegfeld girl and her best friend Henry, a musician. She also meets the two elderly ladies Addie and Lillian who know about the Diviners and guess that Evie is one of them. Theta had an abusive husband whom she accidentally killed with her power, her hands producing heat. She fled to NY where she met Henry who helped are with an abortion and took her in. Henry can walk dreams. Naughty John finds his first victim in Ruta, a young girl going home alone and takes her eyes. He takes different body parts to gain strength as part of a ritual. During the murder he sings a creepy song. Memphis Campell is a runner for Papa Charles who wants to write poetry. He used to be able to heal with his bare hands. He lost his ability after he tried to save his mom’s life. When Evie runs into Sam again, she steals his jacket which he will only get back in return for her money. Will is asked to help the investigation of the murder of Ruta because of its occult nature. Evie tags along and reads Ruta’s shoe clasp and is disturbed by what she sees. Sam comes to the museum to get his jacket back and promptly lands a job. He secretly wants Will’s help to find his missing mom who was involved in “Project Buffalo”. Tommy, a kid, falls victim to Naughty John. He takes his hands. Evie, Sam and Jericho investigate a church where they come across the “Pentacle of the beast” symbol, an emblem of a religious cult which was drawn at the murder scenes. They later find a book on this describing the steps of the ritual. At a bar, the Hotsy Totsy, Theta and Memphis meet and realize they are having the same dream, both seeing the symbol with the eye. Evie is there too and gets arrested during a raid. When Will wants to send her back home, she tells him of her ability. The next victim is found (John took his feet) and when Evie reads his ring she hears the song. The detective recognizes it and makes the connection to John Hobbs, a serial killer long dead. Blind Bill Johnson who lives on the street, had a gift too but was made to use it too much so that his body aged too quickly. He now seeks revenge. When Memphis visits the museum he mentions that the old mansion Knowles’ End, a house John Hobbs lived in, looks inhabited. Evie and Mabel go investigate and find a diary of the former owner of the house. They learn about what John and his companion did when they moved into the house. Evie and Will visit John’s old companion. They find out that they need a pendant of his to banish him which was buried with him. Meanwhile Jericho is falling for Evie but is too shy to do much about it. Evie also realizes that he not such a bore as she first thought but doesn’t want to think too much about it because of Mabel. Sam on the other hands flirts with her like no other but she is mostly annoyed by him. When Will, Jericho and Evie dig out the pendant the cult members see and threaten them. While they flee, Jericho gets shot. They heal him with all his leftover serum and Evie learns about his condition. While they were busy digging up the pendant, John made his next offering by killing a women and taking her tongue. The next day, Will is arrested for the murders because John planted evidence that led to Will. The police also takes the pendant with them. Jericho and Evie go to Knowles’ End to burn it down, hoping this will banish John. The house won’t let them out again though and John is on his way to them. Jericho inhales a drug and starts acting all weird. When he falls down into a room and is unconscious, Evie is alone with John. He wants to use her as his final offering. She uses her pendant (a coin she got from her dead brother James) to banish the spirits John called. John himself gets sucked into the pendant and it falls to ashes. A fire catches and after Evie and Jericho leave the house it explodes. The police makes up a story about the killer being shot and his body being lost in the house. Memphis tries to heal Isaiah and realizes he can heal again. Evie interrupts a discussion between Will and Sister Walker. They were talking about Diviners and Evie. When Will wants to send her back home, she tells the press about her ability. Evie is having another dream with her brother. It’s the first time that he talks to her in a dream, saying “They never should have done it”. To get a clear head after, she sits on the roof. Jericho joins her and finally makes a move. They kiss. Thank you! I was hoping to find a summary of this before the second book that I pre-ordered arrives. Love the website! Thank you SO MUCH for recapping this! It’s been actual years since I’ve read this. Thanks so much for this! Just started Lair of Dreams and I was getting a leeeetle bit confused keeping track of who all the characters were. It’s been over a year since I read this, and I desperately needed the refresher. This helped infinitely!